A mid heel dyeable bridal shoe in ivory satin. 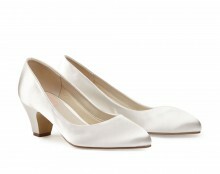 Block heel court shoe. Click the button below to add the Joy by Paradox Pink to your wish list.